The Miami Heat is averaging almost 102 points per game against the Chicago Bulls so far in the NBA Playoffs, and that is including their 93-86 loss in Game 1. LeBron alone is averaging almost 23 points per game, along with a good number of assists. Even without D. Rose, the Bulls are no pushover of a team. 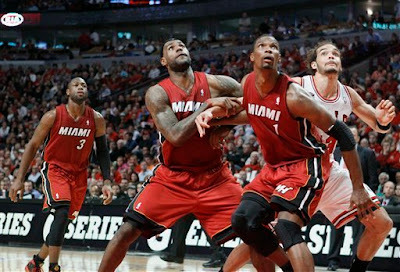 Until a team can prove they can beat Miami in a full series, I'll pick them to win this year, next year, and so on.